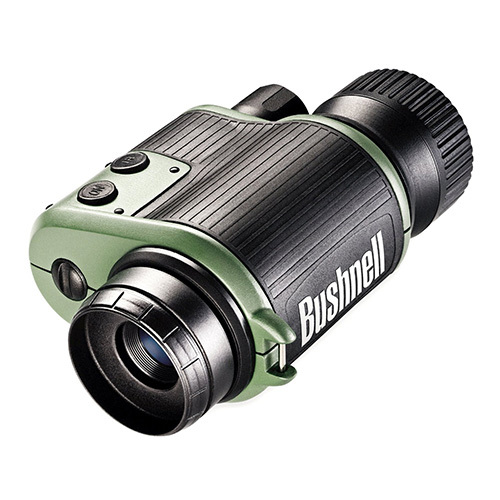 This is a great looking and easy to use design that Bushnell makes use of with this monocular night vision device. It is not surprising since Bushnell makes it that it’s built more like a binocular that is missing half of it as opposed to some of the other more tubular night vision products I tested. When I first picked it up I couldn’t help but notice how comfortable it was to hold too. There really was nothing to setup on it before you can use it either. You just have to insert 2 AA type batteries which are not included. The owner’s manual is very detailed and simple to understand so you will be using this device in no time once you install the required batteries. It also includes a pleather case for transporting it easily and safely and it also includes a comfortable lanyard for securing it around your neck too. This device also comes completely ready to be tripod mounted. It was very easy to be impressed by this monocular night vision device right out of the package. You don’t get much higher quality enhanced imaging products than those made by Bushnell and this monocular night vision product did nothing to hurt that reputation. Its first generation infrared optics rivals those of more advanced subsequent IR generations at a fraction of the cost of devices that make use of those. Bushnell thought of just about everything when they made this device. From its advanced infrared illuminator to its comfortable and easy to operate design it is a product that exhibits quality. It is a device that has few flaws in my opinion. You can tell I get very excited when talking about this great, affordably priced night vision product. For all that you get with this device it might be fairer to put this product on a list of its own. Like many other reasonably priced night vision products this Bushnell monocular night vision device uses first generation infrared. I did immediately notice that it was the highest quality first generation infrared I have ever seen on a device. That is a lot to be said since I have tested many of them. Its infrared illuminator also will help you identify even the darkest of objects at night. Once you press the button to paint an object with the increased infrared beam, it then returns a very high quality image of that object. You can get a clear picture of just about any object you wish to view at night. This type off infrared illumination is not only perfect for hunting but is also excellent for such things as nighttime marine navigation. It also comes with a 24mm lens that offers you a very wide field of view; up to 105 feet at almost 1000 yards. That means you won’t miss any game that crosses your path because of tunnel vision like some monocular lenses can cause you to have. It also features 2X magnification. That means you will be able to zoom in on an object a little but still not have to sacrifice your field of view or image quality. This is a big plus when it comes to identifying objects or animals at night that are several hundred feet away from you. The optics in this Bushnell monocular device are of really high quality all the way around to say the least. One has to admire the construction of this monocular night vision device too. It is made of a very solid plastic material that is very dent and scratch resistant. It also features a very large rubberized grip area so you can easily and comfortably hold onto this device even in adverse weather conditions. It is highly water resistant which is great because many times bad weather makes for great night hunting. It is also a monocular night vision product that is very ergonomically designed. When you are holding it you can easily work the two control buttons or make the necessary lens adjustments that you need for optimal nighttime viewing. There is even a sturdy anchor built into this model for which to attach the carrying lanyard that comes with it. Being able to mount it on a tripod is a huge bonus too if you are a hunter that likes to take down game from a tree stand. What i liked best about this particular Night Vision Device? There were so many nice features about this product that it is very hard to select just one as its best feature. If I had to choose what I was most impressed with about this Bushnell night vision product I would have to say that it’s the superior illumination that you get with its first generation infrared technology. It just seemed to be a step up on the competition. It is technology that will enhance even the darkest of objects when you hit them with the illumination beam. It tends to return a very clear image of those objects too without a lot of distortion. It is hard to beat this type of infrared capability for a product in this price range. It may not be state of the art military grade technology but it does the job very nicely nonetheless. You will pay a little more for this night vision product than you will for some other models I tested but it is well worth the slight extra amount of money in my opinion. From its solid design all the way through to its advanced night time imaging it reflects everything you would want in a quality night vision product. This Bushnell night vision monocular is so easy to operate and returns a high quality night image of whatever you are looking at with it. It’s also very well put together and even looks great too. It is definitely a monocular night vision device that I feel is a step ahead of all its similar competitors. If you are not on a limited hunting budget then you can never go wrong purchasing this device to totally enhance your nighttime hunting experiences.